Uncategorized Made in the Midlands members held a successful networking session as guests of The University of Wolverhamptons School of Engineering and MIM patron, law firm FBC Manby Bowdler. The School of Engineering is based at the universitys Telford Campus, which has undergone an investment of £12m - with more set to follow, including the installation of a new wind tunnel. The School runs under and post-graduate courses in subjects including aerospace engineering, automotive, chemical, electronics and telecoms, as well as mechanical engineering, mechatronics and motorsport. It aims to turn out 250 industry-ready graduates and engineers each year. It is also running three-year manufacturing apprenticeship degrees. The University showcases the work of the School of Engineering under the banner UWR (University of Wolverhampton Racing). The academic institution is the only University which competes in the Formula 3 F3 Cup competition, while the team also races in the Morgan Championship. The UWR team is made up of 31 students from various courses, who work under the guidance of experienced staff from the professional motorsport industry. While studying for their university degrees, students spend their evenings and weekends gaining valuable industry experience in professional motor racing, developing road cars via racing, or designing and building a race car from scratch. With aspirations to work in motorsport, the engineering students are taught how to run a car professionally under the help and guidance of university staff. Their professional approach and passion for racing has seen the team take second place in the 2016 and 2017 F3 Cup championship - coming within a single point of the overall title in 2016, collecting a string of race wins along the way. The 2018 season has also got off to a strong start with UWR driver Shane Kelly claiming victory in the race at Donington Park. 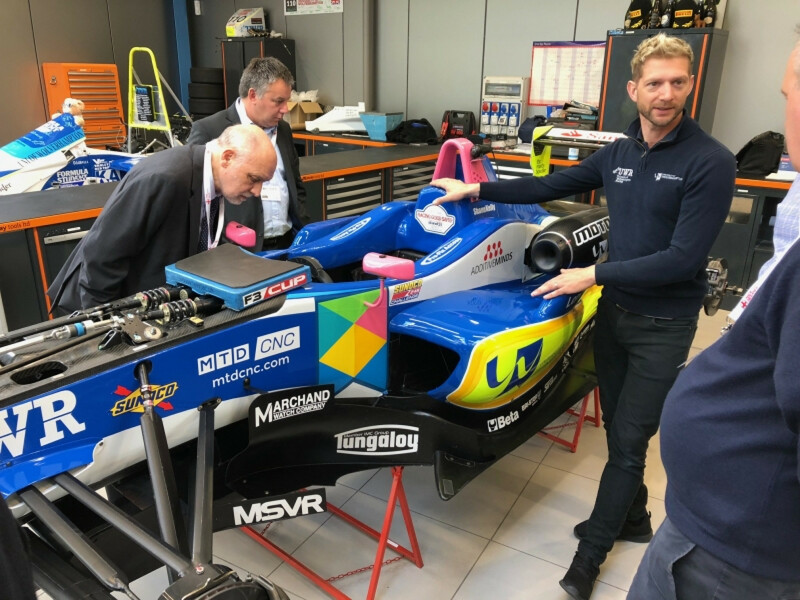 Members were told of the Universitys hopes for the school in a presentation from Vice Chancellor, Professor Ian Oakes, before being invited to tour the workshops where the race cars and prepared by the students. Several MIM members have recognised the costs of running a race team and have agreed to sponsor UWR. FBC Manby Bowdler and Tungaloy both have their logos emblazoned on the race cars.